If you’re anything like me, you don’t really like having someone tell you that you need to relax. So, I will not tell you to relax, but I will say that I am still in a post-vacation bliss. I took a family vacation last week and am almost through the first week back at work. What did I learn? I like vacations. And, I need to take more occasional tech detoxes. I had an unplanned tech detox thanks to problems with my Smart Keyboard. I was able to read Twitter posts, but not reply or type. That pretty much meant that I wasn’t on Twitter that much. I didn’t travel with my laptop and I ended up reading several books and caught up on some magazines and Netflix series. I also made lots of memories with my family and had ample opportunity to sleep in and do very little. It was perfect. It’s great to be back at work. And, I am looking forward to my next vacation, which will be more of a staycation. I have included a photo from my vacation. 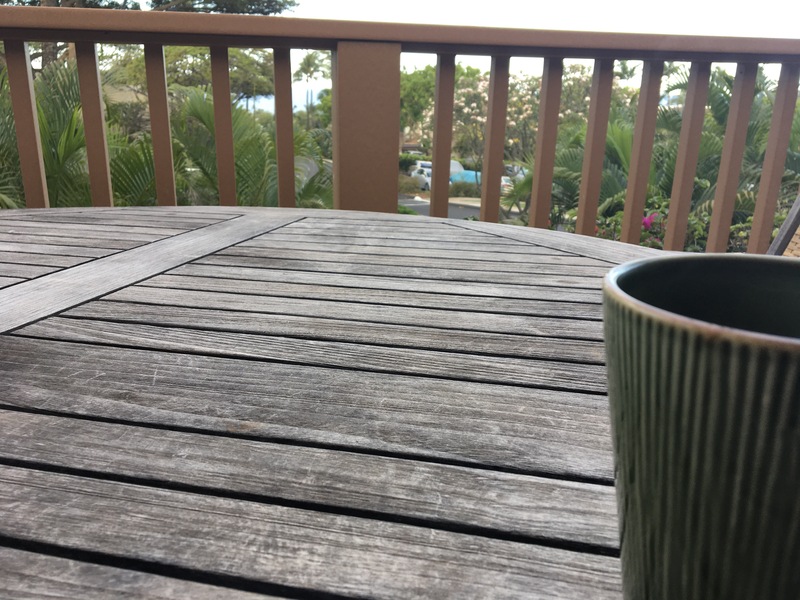 I had my first cup of coffee most mornings on this deck. Academic work requires so much solitary work and this makes it flexible and at times impossible. Work always beckons and the to do list can become burdensome. We are at the start of Summer term at the campus where I work, and it is the perfect time to think about how you can re-focus on the way you work. What works for you? Right about now academics are thinking about the long list of things to accomplish during the Summer. Honestly, though, how do you work? I find that I need some white noise when I am doing certain tasks and other tasks requires quiet or music at a low volume. At the day’s end when I am completely alone this is the time that I listen to music set high. I like to chunk out as many tasks as I can during these evenings alone at work. My job requires lots of meetings and this means that I have to catch up from the meetings. I am an early riser and tend to get lots completed before anyone else in my family wakes up. I have blogged previously about the importance of having good work and life balance and boundaries. I know that this is extremely important, but the reality of work is that some months are more busy than others. I am also trying to think about the way I work and what keeps me organized and able to get things done. I love coffee and the entire process of making and savoring it. This ritual is part of my morning and reading the papers. I also realize that the caffeine is necessary most days. I need desk time to plan and think, and I need to walk around and will find myself in walking meetings. <They are awesome!> . I will talk into my phone and dictate notes from a meeting or send myself emails to update. I also use this time to clear my head and plan for the next meeting, task, or day. I need some alone time to organize my day. I use Todoist to organize my tasks and I have found this tool works well for me. While this is not a feminist rant, I was thinking about this quote and feel it fits.